You hear that? That’s the sound of bananas being peeled across Canada to celebrate the glorious launch of Donkey Kong Country: Tropical Freeze . The newest game in the lauded Donkey Kong Country series swings to the Wii U  system on February 21, bringing with it beautiful high-definition graphics, cleverly designed platforming action and competitive online leaderboards. The game also heralds the exciting return of fan-favourites Dixie Kong and Funky Kong, as well as Cranky Kong, who is a playable character for the first time in series history. Together, they join Donkey Kong and Diddy Kong in the biggest and best Donkey Kong Country game yet – watch for our game review coming soon! In Donkey Kong Country: Tropical Freeze, the lush island paradise that Donkey Kong calls home has been frozen by the invading Snowmads. It’s up to Donkey Kong and friends to make their way through multiple worlds across different islands to put an end to the Snowmads’ icy reign. During their adventure, players will encounter levels that twist, turn and transform in fresh new ways. A dynamic camera enhances levels with spectacular views as Donkey Kong blasts out of barrels and rides in mine carts and on rocket barrels to reach the goal. Joining Donkey Kong as playable characters during his Kong-tastic adventure are Diddy Kong, Dixie Kong and Cranky Kong. Any one of these three characters can team up with Donkey Kong to shake up the action. They also have their own unique abilities: Diddy Kong can hover for a limited time using his Barrel Jet, Dixie Kong can perform a ponytail-spinning move and Cranky Kong can bounce on spikes and other hazards using his cane. Using their own controllers, players can use these partners to team up with a friend in local, cooperative multiplayer, with one player controlling Donkey Kong and the other taking control of one of his Kong allies. Donkey Kong Country: Tropical Freeze is filled with barrels of secrets and collectibles. Cleverly hidden in each level are the familiar K-O-N-G letters and puzzle pieces that players can collect to unlock additional content. Rambi the Rhino also makes a welcome return and can be ridden to charge enemies and discover hidden areas. Funky Kong runs the game’s shop and sells items that help in various ways, from a Green Balloon that protects players from deadly falls to a Red Balloon for extra lives that comes in handy when tackling the game’s challenging levels. 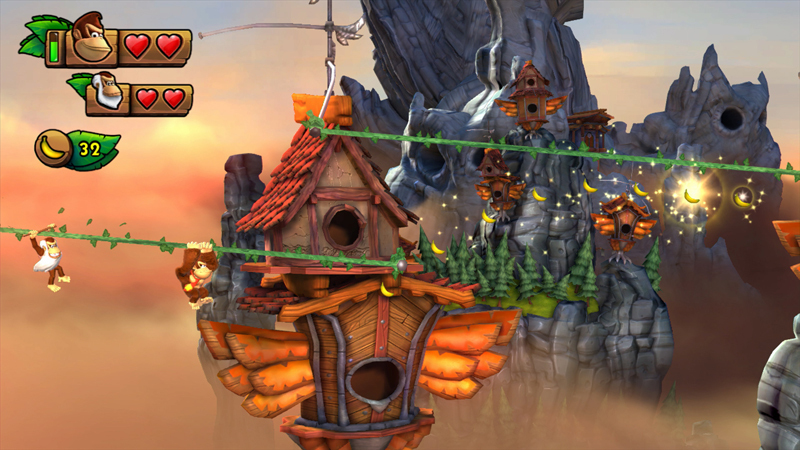 All the levels in Donkey Kong Country: Tropical Freeze are full of variety – no two levels are the same. In some levels, players will be jumping and swinging through a lush jungle full of creative platforming challenges. In other levels, players will navigate Donkey Kong in a speeding mine cart, or see him only as a silhouette against gorgeous backdrops. 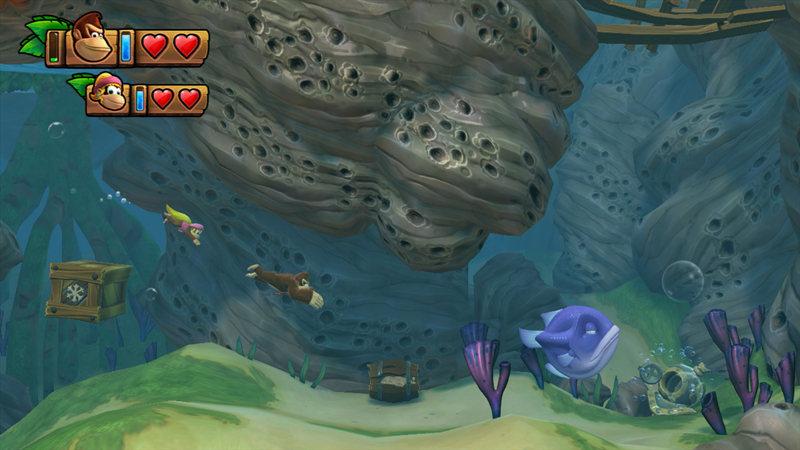 In others, the Kong heroes will swim through underwater levels, battling menacing aquatic enemies. And in frozen levels on Donkey Kong Island, Donkey Kong and his buddies will have to contend with the frosty surfaces of their conquered home. There is always something surprising to experience in the game, and everything is displayed in beautiful high-definition graphics (a first for the series) and accompanied by music composed by David Wise, the composer from the original Donkey Kong Country game. As robust and fun as the single and co-op multiplayer modes are, the game also features online leaderboards that let friends with broadband Internet access compete in things like level times, medals earned and whether levels are completed without losing any health. This expands the scope of the game play and opens up the experience to people all over the world. When players acquire Time Attack medals, they can make a video of their play sessions in individual levels that other players can view in the in-game leaderboards. Donkey Kong Country: Tropical Freeze will be available on February 21 in stores or in the Nintendo eShop on Wii U at a suggested retail price of $54.99. 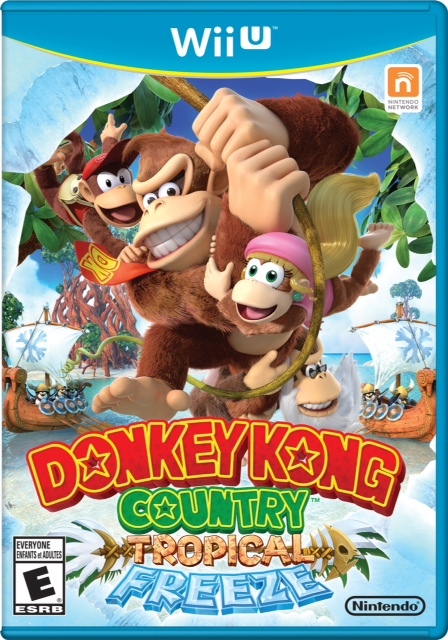 2 Comments To "Donkey Kong Country: Tropical Freeze Reunites Friends for a New Wii U Adventure"
Donkey Kong Country: Tropical Freeze Reunites Friends for a New #WiiU Adventure  Watch for our review, coming soon!